The majority of the greatest stock winners have been traced with the Cup and Handle stock chart pattern. It was brought to light by William O'Neil of Investors Business Daily (IBD ) and was introduced in his 1988 book, How To Make Money In Stocks, along with his CANSLIM system. As the name implies, the cup and handle pattern resembles the profile of a tea cup with a handle on the right side. The basic idea is to wait for an advancing stock to go through a correction, then buy your shares on a breakout as the stock recovers. Left Side: The cup and handle pattern begins with a U-shaped formation in which the stock initially drops approximately 20% to 30% from its peak (from point 1 to the bottom in early March). Stocks that drop 50% in a Bull Market have a higher failure rate & usually fail 5% to 15% beyond their breakout. (During bear markets, a decline of up to 50% may be a normal part of this chart pattern.) A weak overall market or disappointing news about the company could have triggered the drop. This should take a min of 2 wk’s & should not drop like a stone. This means Institutions are supporting it, a positive sign. Bottom: Volume decreases as the stock goes through the bottoming phase, indicating the selling wave is dissipating. Volume climbs on days or weeks when the stock closes higher, suggesting that buyers outweigh sellers. A volume spike with no price increase is good as this shows buyers are in for support. Right Side: The stock stops climbing at a point roughly equal to the prior peak (1'st or 2nd resistance) or within 5% to 10%. Usually, the reason is that investors who lost money during the sell-off decide to sell the stock, content to walk away by just breaking even. Look for gap-ups & days when the stock jumps on heavy volume. This is a sign of Mutual Funds buying. These big up days on heavy volume should not give way to reversals down on heavier volume. Ideally your stock will digest it's big moves with flat or slightly down days on lighter volume. Handle: This sets off another period of consolidation in which the stock moves sideways and drifts lower again -- as much as 12% to 20% in bear (down) markets and generally 8% to 15% during bull (up) markets. The smaller the retracement is, the more bullish the formation and significant the breakout. This is the "handle" part of the cup and handle formation. The handle should form in the upper half of the cup and handle. Volume should also dry up (the lighter the better) & there should be a price tightness. This means sellers have cleared out! Breakout: After several weeks (sometimes as little as one week), the stock jumps higher. The buy point, or pivot point, is when the stock price breaks above the prior peak price in the handle area by at least 1/8 of a point. The pivot is also characterized by a surge in trading volume of at least 50% above the average volume over the past 50 days(50 day avg.). See Pt. 3. If the stock hesitates or eases down when it reaches its pivot, you may want to think twice about a buy. If it powers through and keeps going, you’ve likely got a winner. Breakaway gaps are a positive sign! This is what happened in the above chart (Pt.2). Do not buy if the stock has risen past 5% of the pivot buy pt. because you have missed some of the initial gains, you have less of a cushion to ride out a normal pullback in price. (unless it was a breakaway gap, then it’s ok). This marks an entry of mainly professional investors into the stock. Also, weekly volume on breakout week should be higher than volume of week before. 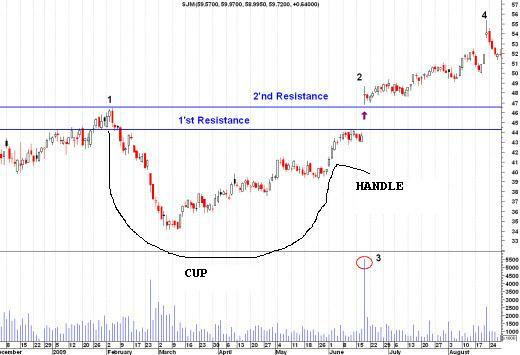 If there is no Handle & pivot point (Cup without Handle), you want the breakout to occur when it is no further than 5% to 15% from below its previous 52 wk or 5 yr high ( not 30% or 40%!) , especially in a weak market. Also, volume will dry up just before breakout. If the stock zooms up and breaks out 30% to 40% from below its old high, it is considered an “overextended” stock, gone up to much to fast. It should move up slowly on the right side. Why Wouldn't You Buy At The Bottom Of The Cup? Because you need to wait for the stock to prove its strength by regaining most of the ground it lost and show it has power and potential. That's why the breakout is important: it usually signals a new rush of buyers likely to take the stock into a sustained climb. Besides, there's no way you can tell for sure if a stock is at the bottom of a cup until the pattern is complete. As with most chart patterns, it is more important to capture the essence of the pattern than the particulars. the cup and handle is no different. Return from "Cup-and-Handle" to the Home Page: "Stock Market For Beginners"